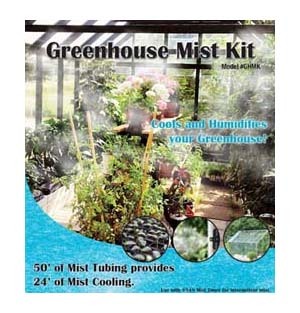 Greenhouse Misting Kit Provides Cooling and Humidity - Complete Kit is expandable up to 60' of misting line. Greenhouse Mist Kit creates an ideal environment that encourages healthy plants to achieve their growth potential by using a misting system. A greenhouse is built to maintain an environment that results in the high quality production of crops you are looking for.Photosynthesis is slowed or stopped when humidity levels are low, therefore making greenhouse humidification an important factor. Greenhouse productivity can be dependent on a number of factors and although our Greenhouse Mist Kit cannot control or affect all variables, it does have a positive impact by regulating the temperature, humidity and moisture content within your greenhouse. Greenhouse misting systems enhance ventilation and shading, which can help to avoid greenhouse overheating disasters. They precisely regulate two critical growth factors, for plants to thrive, ideal levels of temperature and humidity, improving productivity and the health of your plants. It accomplishes this by eliminating ‘plant water stress’ which is a primary factor in the growth of all plants. Note: The higher the pressure, the finer the mist. Low pressure may result in wet areas and may not produce a mist, but more of a spray.